This dairy in Palakkad, Kerala spent over Rs.2 lakhs buying water from outside in 2008, since borewell yields were insufficient. This year they will spend nearly eight-nine times less, because of a rain pond. Shree Padre has more. Summer 2009 was very critical in Palakkad. Like normal years, there were no summer showers. Yet, the state government owned Milma diary at Kallepully in city outskirts didn't have to worry. In the last one decade, this was the first summer they almost managed with their own water. Milma Palakkad, started way back in 1968 was getting only 6,000 litres of milk in the initial years. Now its daily procurement has rose to 80,000 litres. The daily requirement of water has also risen to one lakh litres. As such, though all their four water sources - two open wells and two bore wells  are yielding, it was not enough to meet the demand. Construction of well at the diary to pump out the impounded water. Pic: Shree Padre. Palakkad gets an annual rainfall of around 2,400 mms. Though the district has many drought-prone belts, concept of rain harvesting isn't well known. Every year, starting from December, Milma dairy had to get water from outside for their day-today requirements. They used to purchase it from Kerala Water Authority, and also from private parties. The outsourcing requirement grew year by year. In year 2008, amount spent for this grew to Rs. 2,03,660. Surprisingly, in this calendar year, so far, the requirement of external water has come down to almost negligible. Milma spent only Rs.13,200 this summer for buying water. This is the wonder of a rain pond dug last year to hold rainwater. Many other Milma units, like that of Kannur are keeping an anxious eye on this Palakkad experiment. Water scarcity is there in many Milma district units in Kerala. Considering the usual snail speed of government organisations and lack of will to make projects environmentally sustainable, this corrective measure of Palakkad government dairy is laudable. How is that they realised the importance of RWH and implemented it so fast? The dairy management knew the contractor who did rain harvesting structures at Ahalia hospital in Palakkad suburb. A team from the diary went to Ahalia hospital to study their project. That is a rain-shadow area, recalls V Vijayaraghavan, Manager, Milma Palakkad, yet the rain harvesting work done at Ahaliya was very successful. Impressed, they contacted Dr P K Thampi, the consultant of Ahalia project. A project proposal was sent to the higher ups for approval. Milma Managing Director and the board sanctioned it without delay. In the last seven years, more than fifteen such rain-ponds were done in Kerala and Karnataka as per the advice of Dr P K Thampi, a retired geologist. This is possible only in areas with enough catchment and a convenient topography. Basic idea is to dig a huge rain pond in the low lying area of the campus. Seepage to the lower side is cut off from an artificial dyke (wall). Creating artificial dyke demands a good chunk of the project cost. A deep trench has to be taken using polklines till the rocky layer is found. First a concrete bed is put touching the rocky layer. Above that, LDPE sheets are placed vertically and the soil refilled. This dyke successfully cuts off seepage to the lower side. Laying out LDPE sheet inside the trench to cut-off seepage. Pic: Shree Padre. Initially, the project cost was estimated as Rs.9 lakhs. The assumption was that the trench would touch hard rock in about 5 metres. But when they started digging, they had to go up to 11 metres to find the rock. 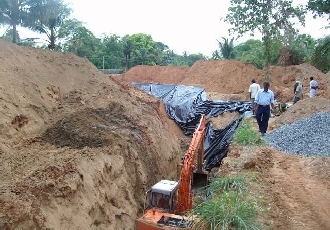 This doubled the project cost, recalls P H Rajeev, who runs Expert Engineers and Contractors that has experience of doing more than a dozen rain ponds. Another interesting feature of rain ponds is that the impounded water is not pumped out directly from it. A deeper open well is dug at a convenient place. Bottom of this well is kept considerably below the bottom of the pond. This facilitates them to pump the water later from the subsoil layers. 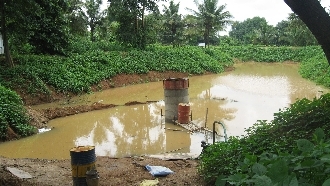 At Milma Palakkad, the well has gone 5 metres deeper than the pond. The wide wells topside is closed leaving a narrow opening where from cement rings are constructed above. This serves as the extract well to which pump is inserted later. The digging of the pond and well was done in 2008 summer itself. But since the well was submerged in water, construction of scaffolding and pump fitting got delayed. This could be completed only in February 2009, after the water level in the pond receded. From March 2009 onwards, regular pumping started from this rain pond. As such, we couldnt get full benefit of the rain-pond. But the initial indications are very encouraging. We brought hand counts of water loads in last summer, Vijayaraghavan explains. Everyday, they pump out water from all their five water sources. Even now, the rain pond gives 40,000 litres a day. If rainfall was good this year, they hope to make do without external water in this financial year. Filled up rain pond in last monsoon. Pic: Shree Padre.